Phi Phi island is no different to the rest of Thailand's ocean and sea front hotel destinations. The high end needs of it’s customers are satisfied with 5 and 4 star hotels, boutique resorts and or lower level star hotels with premier rooms types. Remoter than most of the well known beach resorts like Samui, Phuket, Pattaya etc Phi Phi Island tends towards the bungalow or villa set in coconut groves and the with an easy going tropical architectural style. The key high end villa/rooms offering 4-5 star service are at Loh Bagao or Laem Tong on the north East shore of Phi Phi Don. These bays are far from the main village and are reached by local or resort boat from the main pier on Phi Phi island. 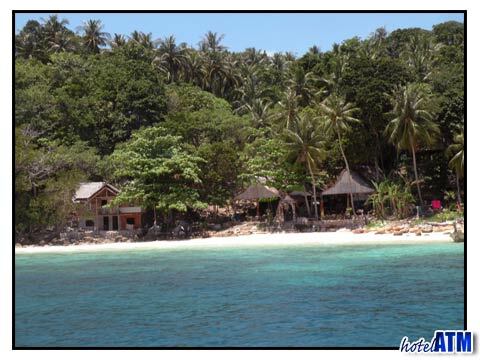 All the resorts below have their own in house PADI resort dive schools capable of organizing fun dives to the best reefs off Phi Phi Ley and courses for beginners. Zeavola Resort is one of the top Small Luxury Hotels of the World. With only 35 villas the emphasis for the boutique resort is style, quality, elegance. Rated the best accommodation on Phi Phi Island. Phi Phi Island Village Resort And Spa and the Jacuzzi Pool Phi Phi Island Village Villa set to the side of the main resort enjoy seclusion with a good variety of hotel restaurants and hotel services and amenities. The Sofitel offer exclusive rooms with stunning views of Bamboo and Mosquito Islands at the service you would expect from international hotel chain such as the Accord group. Unfortunately this is not completed as of Jan 2010. Phi Phi Holiday Inn Resort has delightful bungalow villas set on the famous Laem Tong Beach and a long established record of providing the best on Phi Phi Island. Laem Tong for Phi Phi Holiday Inn or Zeavola Resort. Take the 13.30 Song Serm Boat from Rasada Pier Phuket to Laem Tong. The 08.30 boat from Rasada Pier goes to Phi Phi Don Village. Change here for the final 15-20 minute trip up to Laem Tong. Loh Bagao for Phi Phi Island Village. Take the 13.30 Song Serm Boat from Rasada Pier Phuket to Laem Tong then take the resort pick up to the resort 10 minutes. The 08.30 boat from Rasada Pier goes to Phi Phi Don Village. Change here for the final 10-15 minute trip up to Laem Tong.